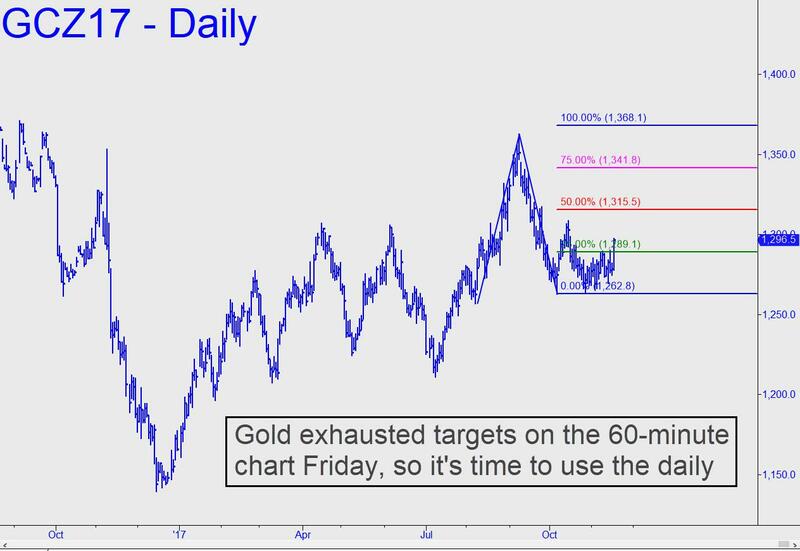 December Gold did something last Friday that it hasn’t done in a long while, exceeding two Hidden Pivot targets on the hourly chart without correcting. One was minor, the other middling, but the implication is that the uptrend is a good bet to continue into next week. Moreover, the exhaustion of targets on the hourly chart will require us to shift to a bullish pattern of larger degree. It is shown in the chart (click on inset), with a 1315.50 midpoint pivot that can be used as a minimum upside projection for the near term. As always, an easy and decisive move past this key threshold would put the ‘D’ target — in this case, 1368.10 — solidly in play.